There are days where I don't want to eat out, nor do I want to make a fuss making a meal that requires a lot of cutting, marinating, and worst of all...clean-up. What are one's options for such an occasion? For most people, the answer is probably Hamburger Helper or Kraft Easy Mac. For me, it's grilling up pre-marinated galbi or bulgogi from my local Korean grocer, and eating it with some rice and pre-packaged veggies. And that's exactly what I did yesterday as I am fortunate enough to have a Korean grocery store called HK Market, conveniently located on my route home. Formerly a Ralphs (or was it Vons?) this sparkling new store also houses a food court with a Korean, Japanese and Chinese food vendor. The store itself is a full-service supermarket with a bakery, and even a made-to-order sushi counter. But my favorite thing about Korean grocers like HK is the packaged banchan and tubs of pre-marinated meats, ready for grilling. 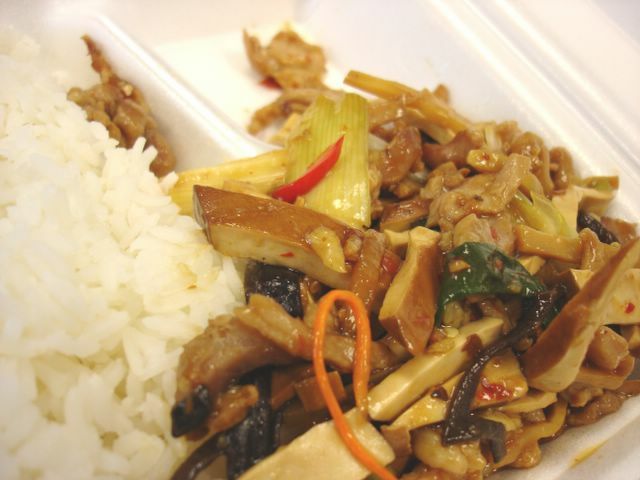 Their banchan (Korean side dishes) are sold in sealed plastic containers. HK has a wide selection. Among the rainbow of choices; pickled Japanese cucumbers, seasoned spinach, green seaweed tossed with sesame oil, creamy potato salad, and the item I picked up last night; marinated bean sprouts accented with green onions and red bell peppers ($1.99/pound). If I were so inclined, I imagine I could pick up a few of these, arrange it over a bowl of rice and make a quick bibimbap for about a dozen people! For tonight, the bean sprout banchan I bought was my side dish. The main course was to be bulgogi, marinated sliced rib-eye. The bulgogi, selling for $2.99/pound, I found to be a bargain. Think of it, how much would rib-eye cost at Ralphs, for example? Twice as much, right? 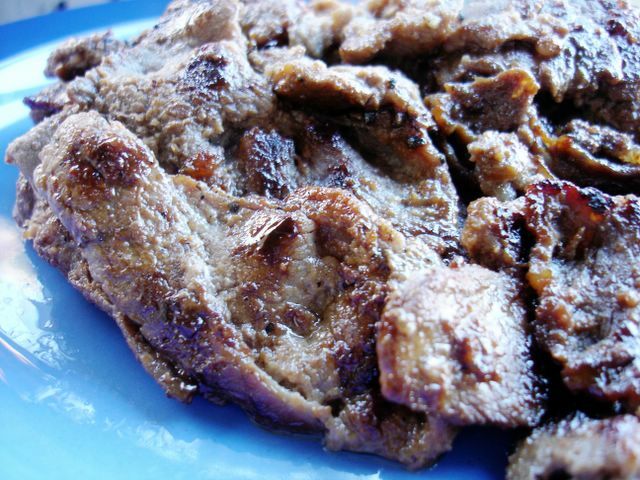 Granted, there is a difference between steak and bulgogi. In any case, HK also offers tender, marinated galbi (beef short ribs) for $3.49/pound, which is also quite reasonable. Once I got home, I fired up my grill and tossed a slice of bulgogi on the grate. But I immediately realized the folly of that decision. Since the bulgogi is sliced paper-thin, the meat slipped into the space between the grates and disappeared into the fire. What I needed was a grill grate with a criss-cross, or lattice pattern, which I didn't have. Ah, but I do have a cast iron skillet. Frying the bulgogi on the skillet was easy enough, but I had to be careful of not crowding the pan. Pan crowding would have given me steamed bulgogi, which was not what I was after. And every once in while I had to scrape of the excess juices that leeched out from the meat before it burned. All in all, I probably put out more work than if I were to make Easy Mac, but I blame that on my lack of equipment, not on the bulgogi. Plus I hate Easy Mac. The bulgogi, on the other hand, turned out delicious and satisfying. 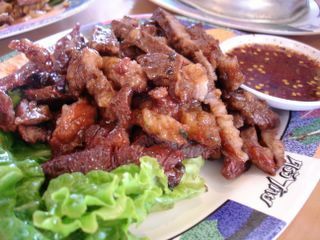 It had the intense flavors of garlic, sesame oil, soy and sweetness that you'd expect from a top-end Korean BBQ joint. With the crisp, refreshing bean sprout banchan and hot steamed rice, it made for a spectacular meal. Who needs Hamburger Helper anyway? Thai food. I must be on some sort of strange binge on it right now, since yet again, I'm posting about another Thai restaurant not even a week after I reviewed Krua Thai. 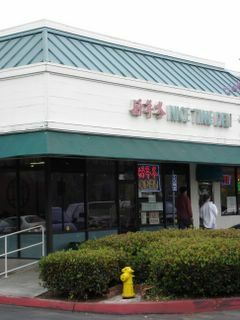 This time though, it's the venerable Thai Nakorn in Garden Grove that will be the focus of my current obsession. 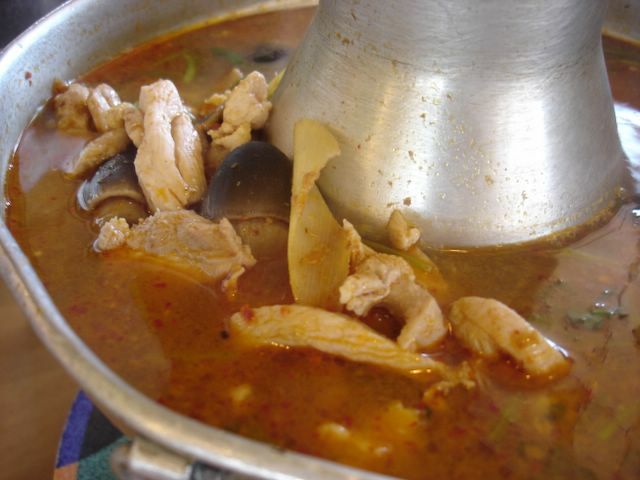 Thai Nakorn, is the "no contest" favorite of mine for Thai cuisine in L.A. and Orange County. No restaurant I have been to in California has come close to reaching the pinnacles of greatness in Thai cookery than Thai Nakorn. (Notice that I was careful to say "in California", since a trip to Lotus of Siam in Las Vegas is a week away). Thai Nakorn Garden Grove is the orphaned child of Thai Nakorn Buena Park, which until its recent demise was, in my opinion, the undisputed purveyor of authentic Thai cuisine. Dazzlingly bright flavors, confident spicing, and efficient service brought my family and I back, time and time again. Friends whom I've brought to dine at Thai Nakorn all agree that it was the best Thai they've had as well. When I found out that the complex where Thai Nakorn has stood for so many years was going to be razed, I was shocked. 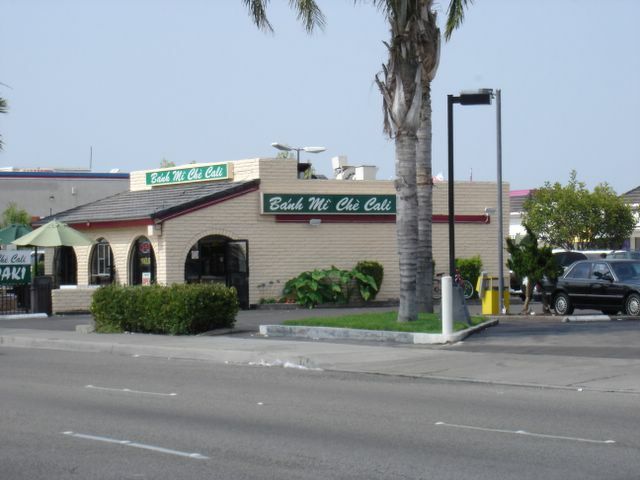 But I was also hopeful, knowing that its new location in Garden Grove was already standing on its own two feet and well on its way to follow in daddy's footsteps. The food we had at the Garden Grove location last weekend was bold and amazing. It's probably because all of the cooks at the Buena Park branch are back at work in the new place. We ate a Pad See Ew that puts to shame the same dish I had a Krua Thai last week. The ingredients used were identical. Chinese broccoli, beef, egg, and flat rice noodles were stir fried with soy sauce. But the execution and the resulting taste and texture were worlds apart. 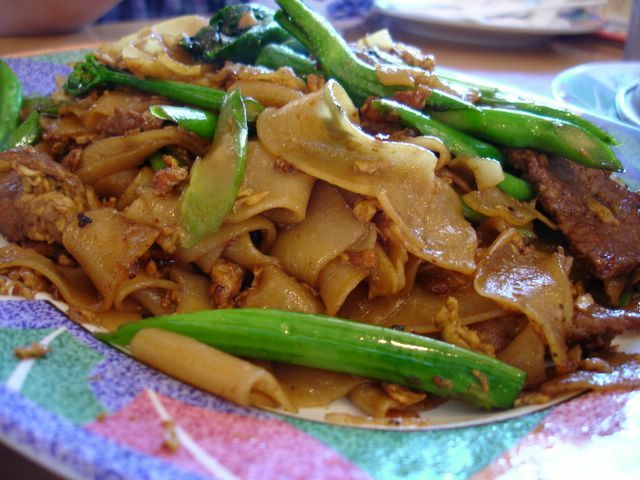 The edge that Thai Nakorn's Pad See Ew had was the smoky character that comes from wok-hey. "Wok-hey", if you don't already know, is that elusive flavor that comes from cooking on a properly hot, seasoned wok. This is a wok so hot that flames erupt from it the moment the first morsel is introduced to the steel. The noodles, the meat, the veggies exuded this flavor, and it took the concoction from a simple stir fry dish to something that is both ethereal and sublime. I can make Krua Thai's version on my home range, but only Thai Nakorn can make Pad See Ew the way that it did. A bowl of Chicken Curry we ordered had a thin layer of glistening fat on the top with the hue of red chili oil. The curry itself was bright yellow and thick like a stew, made hearty with coconut milk and turmeric. Hunks of falling-apart chicken and potatoes completed this rustic meal. Put in on top of hot rice and you'll taste proper Thai curry for the first time. You can imagine this as a one-pot dinner a harried Thai mom would simmer all day to feed her hungry family. Chicken Satay was also good, but an unadventurous choice. Pieces of marinated dark meat chicken were skewered and grilled, served with peanut sauce and fresh pickled cucumbers. They were no better than those I've had at Wat Thai temple, which is to say, they were excellent. 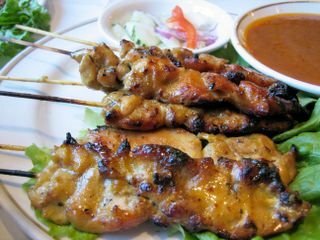 But then, I've not yet encountered a Thai restaurant that does Chicken Satay badly. To make up for the slightly tame choices so far, we picked out the Spicy Clams to ratchet our meal up a notch. The clams were probably the most challenging dish on the table. Seemingly simple and straightforward in appearance, this plate of Manila clams was coated with a dark brownish-red sauce and decorated with errant strands of Thai basil. But that sauce harbored a secret; a secret that I discovered quickly as soon as I took a taste. A funky, mysteriously fishy and rank flavor permeated through this salty, sweet reduction. The aroma will make you think of a dirty, smelly gym sock. Added to that, in your mouth, you will detect a gritty, foreign substance. This dish proved a little too exotic for my Caucasian friend who couldn't quite reconcile what it was he was tasting. Though, for me, it was heaven, since I grew up eating home-cooked meals made with this pungent, stinky secret ingredient of Southeast Asian cooking: fermented shrimp paste. I guess it's just one of those acquired tastes that defines who you are and where you came from. For dessert, we decided to forgo the usual coconut ice cream for some sweet Thai snacks since the restaurant has a counter stocked with goodies. 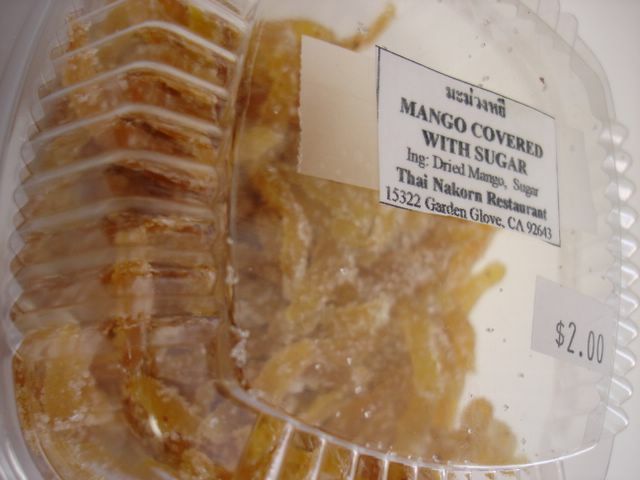 The first thing we picked out was a clear plastic container of dried fruit which was labeled innocently enough as "Mango Covered with Sugar". And that's what it looked like: thin, dried strips of mango covered with granulated sugar. Okay, that sounds good, we thought. But later, when I popped one of these thin strips into my mouth, I yelped, "Holy Shiite!" The damned thing was laced with chili! It wasn't an overwhelming heat, just unexpected. It made me think that it must be Thai Nakorn's idea of a novelty joke! Afterwards, we reread the ingredient list and saw no mention of the chili! We concluded that those sneaky Thai Nakorn people got us good. We owe them a noogie the next time! In any case, the mango "candy", as it were, turned out to be quite addictive, once we got past the element of surprise. *UPDATE (January 8, 2007): Thai Nakorn has been destroyed by an early morning fire. Read the OC Register story here. And click here for a larger post with more photos. What is it about Thai food that always makes for a splendiricious meal? Is it the harminous convergence of all the essential flavors of hot, sweet, sour, and salty? Or is it the fact that it costs so little for so much great food? At Krua Thai, just like almost all the Thai joints I've been to, it's both. Krua Thai in West Covina, as I understand it, is one of the newer branches of this family-run chain. There are big gaudy photos of their dishes on the back wall. These are there to help those not yet well-versed in Thai cooking. You can do take-out here and use those pictures as a guide, or eat in (Don't worry their menus have pretty photos too). The rest of the decor, while new, looks like it came from the uncool part of the late 80's. It's good to know that the set designer for "Saved by the Bell" and "Fresh Prince of Bel Air" finally found work! Nevertheless, everything looks brand spanking new. Their plates, for example, emblazoned with the Krua Thai name, are still unchipped and unscuffed. And although I probably can't say it's the best Thai I've ever had, their dishes are dependably good and the prices are dirt cheap. Nothing on the menu ticks above $8. Most hover at around $6. The Tom Yum Khai had a striking brick red color. Sipping this intense brew, I found it rich and murky, a welcome change from the watered-down stuff sold at lesser Thai restaurants. 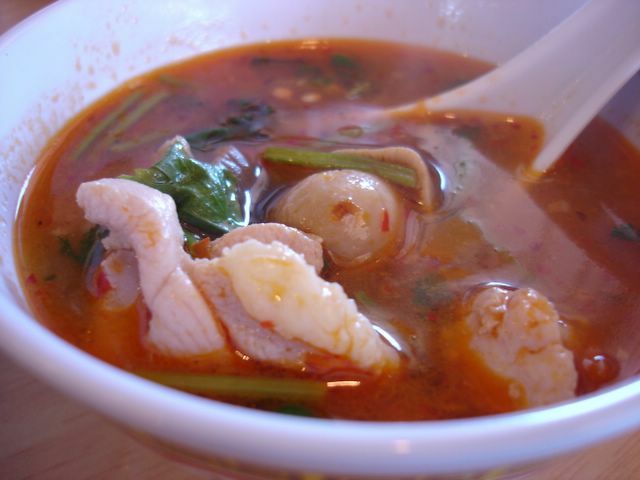 In this lip-smacking broth were shorn pieces of green thai chilis, fat button mushrooms, sprigs of cilantro, and juicy morsels of dark meat chicken. Swimming in it, but not meant to be eaten, were the requisite chunks of galangal, kaffir lime leaves, and lemongrass. These herby staples exuded a pleasant aroma and imparted an exotic flavor. 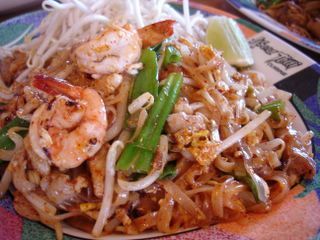 The Pad Thai was also excellent. Egg, generous pieces of chicken and plump shrimp were tossed with thin rice noodles which were expertly stir-fried with a piquant sauce. 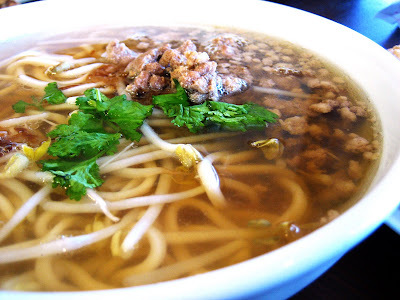 Ground peanut, served on a short mound to the side of the noodles gave it a nice earthy bite, while the cool bean sprouts soothes the palate and provides a crisp textural contrast. 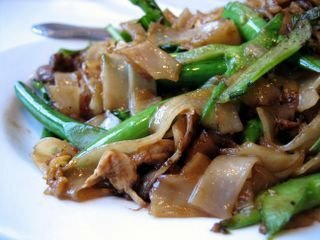 The Pad See Ew was a simple dish of flat, wide rice noodle cooked with soy, crunchy green chinese broccoli, and tender sliced beef. This was the heartiest dish on our table. A delicious and filling concoction, it was dark and salty, but we found it milder than our other choices. Chili sissies, this dish was designed specifically with you in mind. The BBQ Beef was the only disappointing dish of the bunch. The beef was cooked beyond the well-done stage and was now essentially jerky. Even as the meat itself was already overly chewy, the fatty, gristly bits that were included in the dish were beyond edible. The only saving grace was the saucer of dipping sauce that went with it. Thin, citrusy and lip-numbingly fiery because of the red chili flakes, this was about the best sauce I've ever tasted. Douse it on horsemeat and I bet it would make Seabiscuit taste good. I have to say, I am beet red with embarassment. Three writers whom I have the utmost respect for, Kirk from mmm-yoso!! !, Pam from Daily Gluttony, and Mealcentric from Mealcentric has tagged me for the Five Cookbooks Meme that has been floating in the blog ether. It is a topic that I've enjoyed reading about. I'm embarassed because, as I have confessed to Kirk: I own no cookbooks. I must sound like the ultimate foodie poser or something! I have no explanation as to why I own no cookbooks. Truth be told, as soon as I enter a Barnes and Noble or Borders, I head straight for the cookbook shelves. I squat myself down next to them and start perusing for recipes and ideas, and to gaze longingly at all the pretty pictures. But I have not yet bought one in all of my years. I've instead culled recipes from anywhere I could find it from FoodNetwork.com, sometimes Chowhound, and most of all, my mom. None. But I will count two particular books that my mom owns, since I seem to read it everytime I visit my parents' house. This is a great looking cookbook with insightful stories on the background of each dish and has ingredient lists that are never dumbed down. I hate it when Asian cookbooks say they're authentic and then they go and suggest substituting ketchup for tamarind paste. This one doesn't do that. I have attempted and succeeded in trying a recipe for a lip-smacking Tom Kha Kai from this book, eventhough I tweaked it by adding a special Thai chili sauce I found at a local Vietnamese market. This one I think my parents bought at a Chinese bookstore in the 99 Ranch plaza in Rowland Heights. It's got a laminated cover (the bookstore's doing) and is all about Japanese food, written by a Chinese woman, and published by a Chinese company. But it has the pretty pictures that I love to drool at and the recipes seem authentic enough. Haven't attempted any dishes from it though. Maybe soon. Um...ok I bought two cookbooks as gifts for two friends...so I'm definitely wiggling around the true intent of this topic here. I bought this as a birthday gift for a friend who was both a Star Wars nut and an aspiring cook. Suffice it to say, she flipped for it! She thought it was hilarious as did everyone else at her party. I don't know whether she has tried any recipes from it, but I guess that really wasn't the point, was it? I bought this for another friend who had a crush on Ming Tsai. She liked the book, but later said that his recipes turned out to be too complicated and abstruse. I doubt she's made anything from it, but I think she still enjoys looking at the pictures of Ming's chubby face. Again, this is me reading *at* the bookstore. Leafing, actually, is more like it. Haven't learned actual recipes from them. I love his stuff in general. He seems to me as a person who is as literate as he is irreverent. A smart guy, and from what I can tell, a worthy chef. I have all of his "A Cook's Tour" episodes archived. But I agree with Pam: Gotta love a cookbook with profanity. This is simply the most beautifully photographed cookbook I've ever seen. The recipes are like the words of God transcribed on paper. Hmm, I guess that'd be called a "Bible" wouldn't it? Anyway, there'd be no freakin' way I'd have enough cojones to attempt to cook anything he's got in his book. Nevertheless, this tome is one that I actually might cave in and buy for myself. If anything, it's a great coffee table read. None really since I've kind of gleaned cooking knowledge bit by bit from a variety of sources. But if I had to pick one place that I have learned the most from, it would be my mom. She has taught me that it doesn't matter what you cook, as long as you cook it with love and care, and serve your food to people you love and care about. They will appreciate that you've done it for them, no matter what the dish is. If they don't appreciate it, then you've got to seriously reconsider why you love and care for those people. It is through her that I finally understood how satisfying it is when you cook something for someone and they finish every morsel and then ask for seconds. It is one of the best feelings ever! 5) Which 5 people would you lost like to see fill this out in their blog? Professor Salt from You Gonna Eat That? This isn't a sissy's chip. Made from unsold corn tortillas that El Gallo Giro's sweaty staff makes from scratch, these chips are deep fried in a big vat of hot grease, salted, and bagged before selling. You can tell immediately: these aren't good for you. The small beads of oil clinging on the inside of the bag should be your first clue of this fact. But then there's the actual written warning that these buggers are also perishable. It says right on the bag, "Refrigerate after opening". You should read this as "This chip was fried in grease and is still dripping in it." Well, at least you aren't putting any unnecessary preservatives into your body, just fat and good ol' cholesterol. And think of it, for only $1.69, you will make your doctor gainfully employed for some time to come. At first, I was afraid of the chip. Taking the first one out of the bag, I wasn't ready for how greasy it was. It looked like it had suntan lotion on it! Seriously, all it needed was a pair of speedos and a cheap pair of sunglasses, and it'll be ready to go lounge by the swimming pool and ogle the girls. It was that kind of chip. Then there was the thickness. It's dense and rigid, not unlike a slab of ceramic tile. 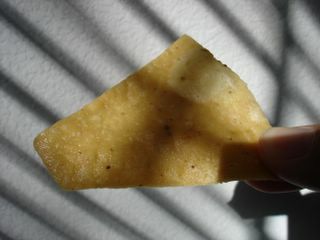 When I finally took a bite, that's when the jarring force of the chip hit me. The crunch reverberated through my teeth and amplified in my skull. Inside my head, it sounded like a mack truck was running over a pile of wooden palettes. Foley artists, take note: this chip should be a tool of your trade if you ever need the sound of bones being crushed. After a few more chips, jaw fatigue set in. I licked my greasy fingers, put some chips on a plate and piled grated cheddar on top. Then I nuked it to do impromptu nachos. Somewhere out there, a heart surgeon buys a new Mercedes. As much as I make fun of Irvine on being a gentrified and Stepford-like city, I adore this town and would like to present the case that Irvine, in fact, also has a growing and vibrant ethnic community. Take for example the two mini Chinatowns that my city harbors. Nestled in the heart of the Irvine, and a scant two blocks away from each other, these are urban oases of Chinese culture and cuisine. The anchor for the two Chinese plazas is 99 Ranch Market. Here you can buy fresh produce and live seafood at lower prices than the local Ralphs. Orbiting the two 99 Ranch are shops selling Chinese pastries, boba teas, konjak ice drinks, dried fruits, Chinese cookbooks, and jade jewelry. For authentic Chinese cuisine, there's Sam Woo and China Garden, just to name a few. And finally, what Chinatown would be complete without a Morning Glory shop, a cutesy-girly store selling all types of pastel-colored and glitter-dusted Hello Kitty crap. Then there's Irvine's Little Tehran. On Culver, flanked by the 5 Freeway and Walnut, this small pocket of ethnic flavor boasts a market called Super Irvine, peddling all kinds of exotic Persian treats like Mashti Malone ice cream. In the same plaza is Caspian, a behemoth of a restaurant that shares a parking lot with at least one more Persian eatery. My favorite place in Little Tehran is an unassuming pastry shop called Assal. It's next door to a Domino's, of all things. As soon as you come in the door, your olfactory glands are hit with the heavenly aroma of roses and cinnamon. Dainty cookie baskets line a spotless counter and sublimely decorated petite cakes and pastries glisten behind a glass case. Assal Pastry also happens to be the only bake shop I know of that sells pastries by the pound (around $8.25/lb). 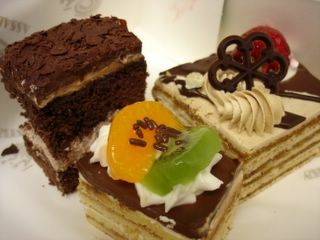 One night, we left with a box full of about 15 small cakes to sample to our hearts content for about $14. I've found that it averages out to about $1.00 a cake, but could be more if you choose the denser custards or fruit tarts. Although sometimes, I do find it a little disconcerting that they don't zero out the weighing scale before they put my box of chosen pastries on it. That's a pastry or two that I'm missing out on! In any case, whatever the cost, I think these little jewels are worth it. The texture of their cakes are airy, light and spongy, with a delicate and not-too-sweet flavor. Some cakes have a silky and luscious layer of chocolate ganache. Others have mocha cream. Assal's fruit tart, an artfully arranged rainbow of strawberry, kiwi, grape, and orange is perched on top of a cup made of a crispy, dense crust lightly painted with chocolate. It's a beautiful marriage of custard, crust, chocolate and fruit. Fried lavash, a brown and crispy flatbread is sticky sweet with a glaze made with honey and rosewater. Yes, Irvine may be a master-planned community, proud of its low crime rates and unaffordable housing. But look beyond the staid starkness of the Irvine Company's attempt at a suburban utopia and you will find a treasure trove of ethnic flavors and cultures. It's this symbiotic relationship between these two Irvines and the pleasant dichotomy it presents that, I think, makes my city great. There are days when you find yourself with absolutely no cash in your wallet, and no desire to rack up bucks on your plastic for just a workday lunch. I found myself in this very situation last Friday, and serendipitously, I had a load of recyclables in the trunk that I needed to get rid of. Plastic water bottles, to be exact. Call it an experiment if you will. What can I get to eat in Irvine with the money from recycling my spent water bottles? So there I was, behind the 99 Ranch on Culver in Irvine, holding two garbage bags of empty water bottles, standing in line to get cash for 'em. Had I been in L.A., I'd be the odd man out in this line, with my Gap shirt and khakis. But nope, this was Irvine; land of the yuppie, poster-child of urban masterplanning. In line with me was this regal white gentleman who could pass for my CEO and an Asian soccer mom. I doubt that recycling meant sustenance to these two. A sense of civic duty perhaps, but not lunch. So my turn was up and lo and behold! $4.75! Not too bad for two garbage bag fulls of trash. With cash in hand, I made a beeline towards Sam Woo BBQ's Takeout area. There's a row of steam tables full of goodies to choose from. Salt and Pepper Shrimp? Nah. Fish in Black Bean Sauce? No, had that a few weeks ago. Ahh. Kung Pao Chicken? No way. Too bourgeois. Ahh. Shredded Pork with Pressed Bean Curd. Haven't tried that yet. With steamed white rice please. $3.18? Comes with egg drop soup? Done. Chang-ching! Rachel Ray, you got nothin' on me! Okay, so it's not the same as eating in the restaurant. The few scoops of rice dumped into sytrofoam container and the mound of the pork dish I pointed to is unceremoniously served up by a sullen, unshaven Chinese man with a greasy apron. But hey, it's a steal! And for a buck more, I could've even gotten another entree added, like the glistening and crisp green beans. I took my meal back to the office and ate it. The pork dish had a subtle flavor, not as spicy as I had anticipated. But the tofu, meaty and chewy, had absorbed the essense of the sauce nicely, with the thin strips of pork playing up the back beat. The stray green onion strand added an herby accent. The soup my lunch came with had cooled enough by the time I got back that it congealed into a gloppy goo. I could've nuked it to bring it back to life, but my growling stomach didn't allow it. With my hunger abated, I finally realized the slight irony; I did use plastic to feed myself after all. Much has been written about Zankou Chicken. From Chowhound, to the NY Times, everyone, it seems, has raved about this L.A. institution. Even Beck references Zankou in his song, "Debra". And for a while, noshing on Zankou's rotisserie bird and slathering it all over with that garlic paste, seemed like *the* quintessential rite of passage for a Chowhound. Deciphering the garlic paste recipe was next in the path of true Chowhoundhood. Although most of the fervent enthusiasm has subsided, perhaps because Zankou comfortably transitioned to become an everyday staple of the Chowhound diet, the restaurant still churns out dependably good chicken. And that garlic paste still does its job, fouling up the breaths of many an Angeleno. Luckily for us in O.C. we have our own solitary branch of Zankou in Anaheim. And for me, in the few years that I held a Disneyland Annual Passport, Zankou food was the default after a food-free day at the park. And man, was it good! Located a few blocks away from Disneyland, Zankou exists in the part of Anaheim few tourist dare to venture. Unlike that tourist-trappy stretch of Harbor Blvd., you won't find cheesy, faux-Fantasyland facades here. No fake lattice-work fences or painted-on ivy. And that panhandler at Zankou's door? What's more, after he's amassed enough change, he'll come in for some Zankou chicken himself. Zankou isn't for the typical Disney tourist. It's too scary for them. Once and again, the Middle Eastern families, working stiffs, and Anaheim police officers who eat here would look up from their chicken and eye the odd group of people with floppy Goofy hats and Mickey Mouse ears. And then they would get back to their chicken, licking those greasy fingers to get every last bit of that garlic paste from underneath their nails. Oh that garlic paste! Packaged innocently in small Solo plastic cups, it is the reason the city of Gilroy thrives. White, with the appearance and consistency of creamed butter, this robust concoction is meant to be slathered onto your chicken and/or pita bread. The tangy garlic punch will elevate the meat to levels beyond where a normal chicken could go by itself. Don't get me wrong though. The chicken is as good as a rotisserie bird can get. Basted with the dripping juices of the other chickens that turn above it, the skin of a Zankou chicken is crispy golden brown and infused with intense flavor. I could eat the skin like chips, if Zankou sold it alone. The meat is lighter in flavor, but perfectly cooked. 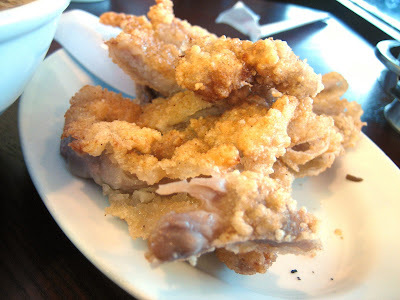 I'm not a fan of the breast, which can be dry, but the thigh and leg meat is always succulent. You can finally feel like a true carnivore when you've finished and you're left with nothing but the bony carcass. Even then, you'll succumb to the urge of trying to pick out every last bit of meat from that nook of joint you missed. 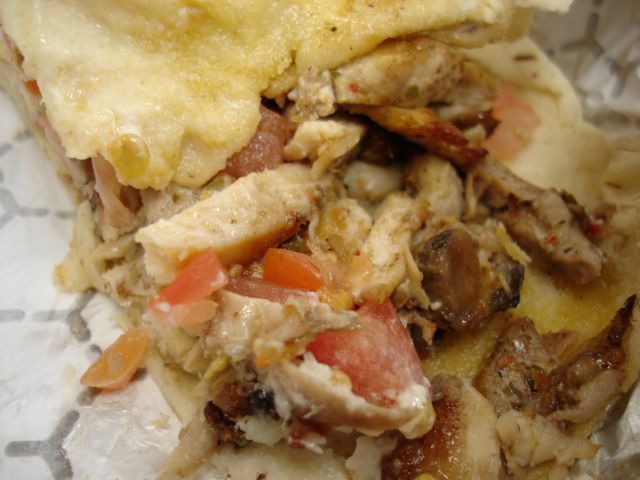 If you don't want to revert to this primal eating frenzy, Zankou offers pre-disassembled meats in its wraps. 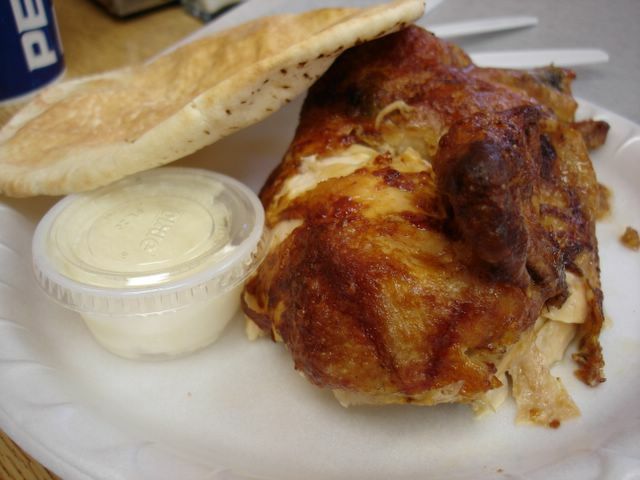 The one pictured here is the Chicken Tarna. It's a generous helping of diced, seasoned chicken, tomatoes and smear of that garlic sauce, wrapped around a toasted pita. It'll spare you the greasy fingers, but not the flavors. Ah yeah, come on. . . I met you at JC Penny. I think your name tag said "Jenny"! I cold-step to you with a fresh pack of gum. Somehow I knew you were looking for some. . .oh no! Even as the humble but still intriguingly exotic banh mi sandwich finds its way to the mainstream, the original mom-and-pop operations, like Banh Mi Che Cali, shall continue to be the bastion against its homogenization and domestication. Still, you have to credit Lee's Sandwiches franchise in introducing it to the average American tastebud. Its gleaming stores and English-speaking employees makes these Vietnamese sandwiches accessible to even the casual foodie and soccer mom. In Irvine, California, it is strategically placed between a Trader Joe's and an In N'Out. To its credit, Lee's takes away the uncertainty, wierdness and funk out of getting banh mi at your average Little Saigon banh mi shop. But Lee's banh mi pales in comparison to the ones served in those shops. But ask your average O.C. resident about Little Saigon, and they'll probably have a vague recollection about a swath of exits on the 405 between Irvine and Long Beach, and how they zip by without a clue of the culinary wonders that lie beyond the exit signs. If you are neither Asian, Vietnamese, or a Chowhound, I doubt you'd be "slumming" it in Westminster, especially for a sandwich. True as they say, "nothing ventured, nothing gained." In my humble opinion and for my money, I haven't had a better banh mi than those served up by the non-English speaking gals at Banh Mi Che Cali. This location on Brookhurst and McFadden is the least intimidating of the two stores. 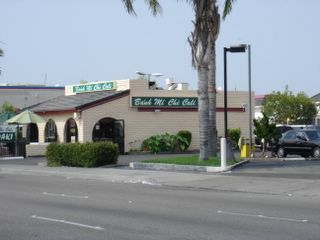 The other, located on Bolsa and Magnolia, is more crowded. There's always a clutterf#$% of people pushing and shoving to the front. The employees there are, not surprisingly, ruder and have no patience especially if you're not Vietnamese. They'll actually ignore you! Eventhough I've mastered the art (or is the "sport") of pushing myself into the front and ordering there, I find that the location at Brookhurst and McFadden is my new preferred place for three reasons. First, it's not as busy, making the servers nicer. Second, it's where the bread is actually baked, resulting in a fresher banh mi. Third, whenever I order the BBQ pork banh mi, they stuff the sandwich so full of meat that it's insane they can still manage to charge what they charge. The deal's a steal! 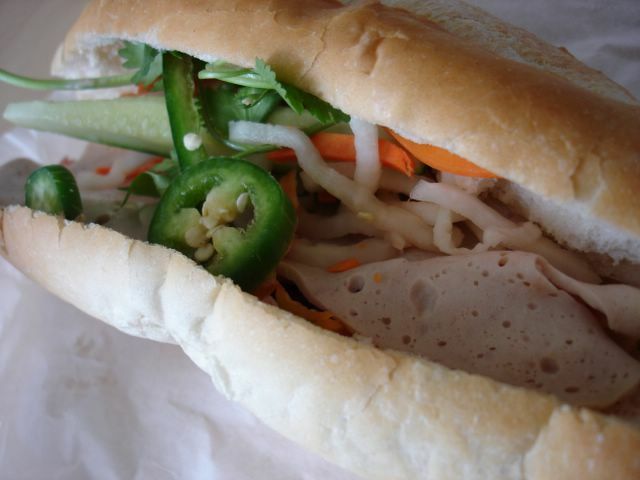 Buy two hoagie style banh mi's for $1.50 each and you get the third free. Essentially, it's 3 banh mi's for $3. No one ever just buys one of the hoagie style banh mi's, so you shouldn't either. But if you really only need one, you might as well spring the extra quarter (you Rockefeller!) for the baguette banh mi ($1.25), which comes in a longer, slimmer loaf of bread. All the banh mi's will have veggie fillings of cilantro, sliced cucumber, jalapenos, and shredded pickled daikon and carrots. They also may or may not have a squirt of homemade mayo and a seasoned soy sauce. There are, of course, a myriad of banh mi shops in Westmister, all of them worthy. Professor Salt's Banh Mi Crawl Report is a useful guide for those in the mood for further exploration. Wherever you go, I think it's imperative to try it at least once from these independent shops. Who knows, maybe within this decade, the banh mi will enter into the American culinary lexicon, like the taco. But before that happens, and before Yum! Brands has the opportunity to bastardize it, I hope everyone gets a taste of how it used to be. A men's magazine was the last place I expected to find advice on cooking. Heck, I can't even remember whether it was GQ, Esquire, or even that soft-core rag, Maxim, where I came across the seemingly audacious headline "How to cook fish". As if it wasn't enough that these magazines dictated that our socks should match our slacks, not our shoes, now they're telling us how to cook? The reason why fish ordered at fancy restaurants tastes so good is because they cook it on rocket hot pans with enough oil to allow the fish to form that golden brown crispy crust. Step 1: Heat up your pan, until it's good and hot on high heat. Step 2: Introduce enough cooking oil to coat the bottom of the pan to about 1/16 inch. Step 3: Season the fish filet liberally on both sides with kosher salt and freshly cracked pepper. Step 4: Wait until the oil is hot and gently place the fish onto it. Immediately jiggle the pan vigorously for a good 30 seconds. Keep the fish moving so it doesn't stick to the pan. Step 5: Stop. Turn down the heat to medium. Leave the fish alone to cook and form that crust. Step 6: Flip over when a good brown crust forms on the bottom side and the sides are opaque. Step 7: When the other side has a nice crust, lift and serve. A few months ago, coming back with the salmon I bought from Costco in Irvine, I finally swallowed my pride and prepared it this way. Suffice it to say, I haven't grilled or baked salmon since. This method of preparation is fast, easy, and produces a fish filet that is most undoubtedly unhealthier, but damn, is it good! That GBD (Golden, Brown and Delicious) outer crust has a concentrated flavor and texture all its own, while the middle remains moist and pink. I routinely serve this salmon sans sauce, just a wedge of lemon. 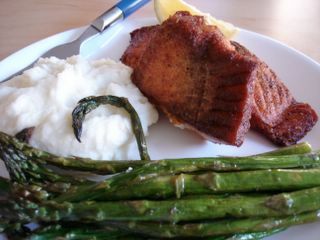 I make simple sides of homemade mashed potatoes and oven roasted asparagus, to round out the flavors and make a meal. Sound advice on cooking from a men's magazine...whodathunkit?! Okay, so they were right about the socks too. Dining in Houston's feels like spending time in an exclusive cigar lounge in upper-class urban America, where I imagine monocled rich white men with starched collars would congregate and speak in low tones, curvy pipes in hand. Almost stuffy, but not inaccessible, it's one of a few restaurants in Irvine where one can break away from the "Olive Garden crowd". Modern touches like spot lighting accent dark burnished woods and soft leather booths to create a luxuriously seductive dining room. The service matches the decor; precise and professional. It's clear that the waitstaff have their game on. Six different orders of Coke; 2 Cherry Cokes, 2 diets, and 2 plain were served correctly in front of the person who ordered it, with nary a mention of "Okay, who had the diet? Who had the cherry?" The entrees also came out in choreographed unison. The food is top notch, with more hits than misses. The grilled rib eye was cooked exactly to how I take it; pink but not bloody. The crust on the beef had a glaze with a dark and sticky sheen, imparting a deep candy-like sweetness and teriyaki zing to each hunk of cow I cut off and shoved into my watering mouth. The meat was well-marbled and as tender as I've ever had. I felt bad that I actually finished the whole inch-thick slab, a feat I rarely accomplish. But even after polishing off the carbo-bomb that is Houston's fat baked potato loaded with bacon, sour cream, scallions, cheese, and a golf-ball-sized chunk of butter, I still couldn't resist stealing a few "knife and fork" ribs from an adjacent plate. These baby backs were glazed and roasted to a dark perfection. The meat on each rib ripped easily off the bone with a gentle tug of my teeth. A stack of stark white bones was the only sign of our conquest. And the fries! Oh the fries! Thin and looking more like potato sticks than your typical french fry, these must have been fried with a little beef fat to come out this good. Less successful was the night's "special" of grilled ono. The fish, ordered by us with a knowing disregard to Anthony Bourdain's rule of not ordering fish on Mondays, was tasteless and dry. No amount of lemon drizzling could summon any life into this plain and abnormally tough piece of fish. The side dish of asparagus was overcooked beyond squishiness. The slaw which had accompanied the "Knife and Fork" ribs had a strange, overly fragrant herb appropriate for cologne but odiferously off-putting in food.